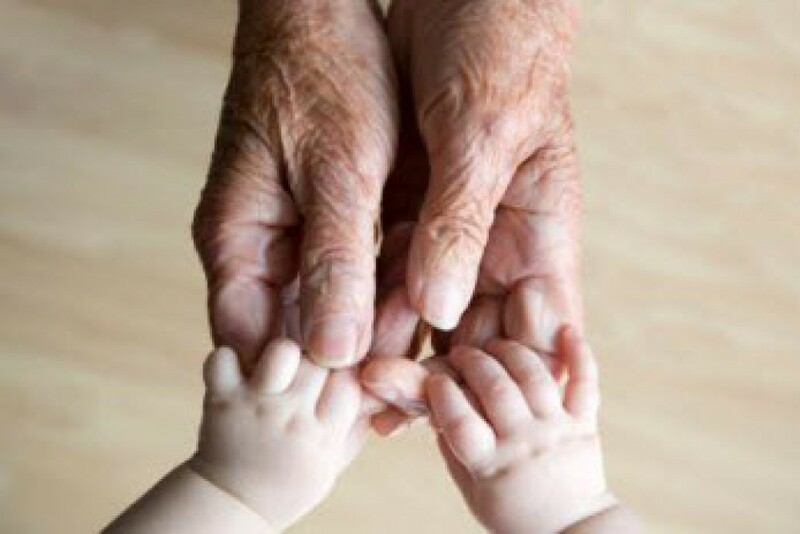 This is the age when so called “multitasking” is a goal, a thing to aspire to and maybe even train for. Doing several things at the same time seems the only way to get everything done in a day. Who wouldn’t strive to be a multitasker? It’s like having a super power. Being able to do multiple things all at once certainly is a skill worth having. Right? The truth is . . . . . you can’t do it! The brain cannot do more than one job at a time. 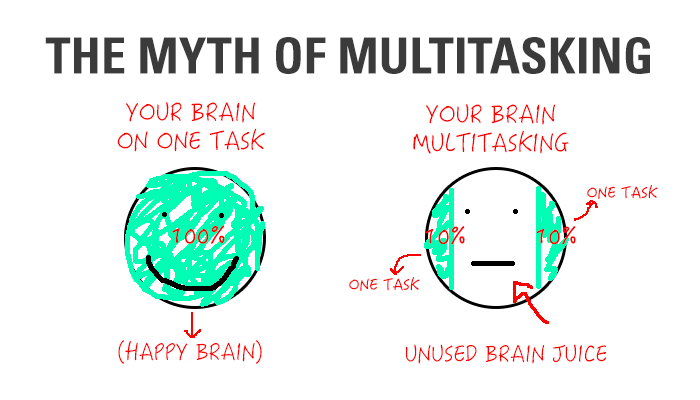 What your brain is actually doing when you “multitask” is switch from one task to another. The problem is you lose time as you switch back and forth. 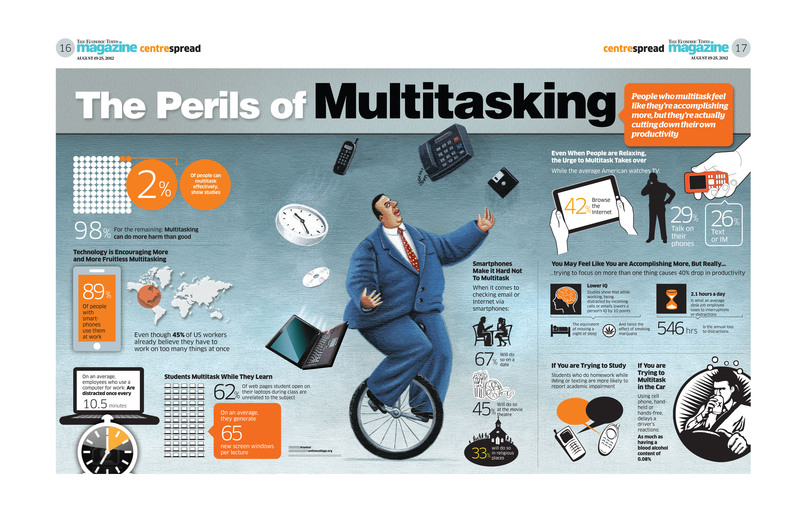 While “multitasking” may seem efficient, tasks may actually take more time in the end. 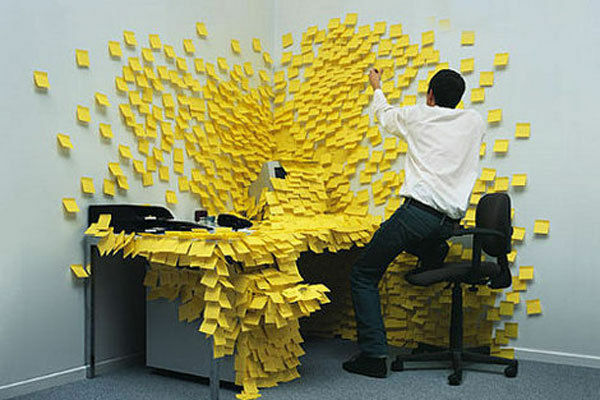 Studies show an average of two hours is lost every work day to job-switching and recovering from distractions. 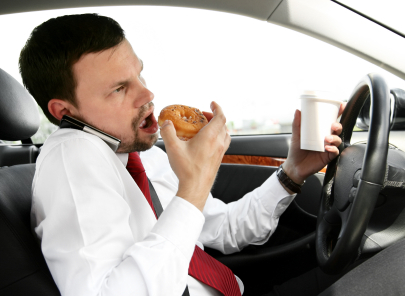 Texting while driving is the most dangerous distraction says the U.S. Department of Transportation. Research shows that sending or receiving a text takes a driver’s eyes from the road an average of 4.6 seconds. At 55 mph that’s like driving the length of a football field with your eyes closed! Researchers have also found that trying to learn something new while “multitasking” is nearly impossible. Besides that, multitasking has been found to temporarily lower IQs by 10 points – that is the same effect as missing a night’s sleep! Mealtime is an especially bad time to try to “multitask”. Not only does it set a poor example to be texting and phoning while eating, but it makes everyone else feel neglected and ignored. In one study, subjects who ate meals while watching TVs or computer screens were unable to recall how much they ate. The plugged-in eaters also snacked twice as much as those who focused on their food during mealtimes. There is a big price to pay for those who use several types of media all at once. A Stanford University study compared two groups: those who regularly do a lot of media “multitasking” and those who don’t. The “multitaskers” scored lower on ignoring unimportant information, remembering important information and switching from one task to another. In other words: the minds of the “multitaskers” were not working as well as they should. – Stay rested and get enough sleep. – Keep healthy food and water within reach. – Keep a manageable to-do list. Enough to keep you busy but not overwhelmed. – Check emails a designated times only and then for the rest of the day put it to rest. – Stay on task. One thing at a time. – Take time outs during the day. Listen to a song, take a walk, take deep breaths. – Make phones and TV a no-no at the dinner table. – Log off all electronics one hour before bedtime. – No texting while driving. This entry was posted in In the Village and tagged confidence, life, multitasking, peace, strength, truth, wisdom by The Village Granny. Bookmark the permalink.